We’d love your help. Let us know what’s wrong with this preview of It's Okay to Miss the Bed on the First Jump by John O'Hurley. Charming and hilarious, It�s Okay to Miss the Bed on the First Jump is more than a mere celebration of man�s best friend. In this lighthearted and reflective exploration of how and why dogs have served as some of our most valuable and enlightened teachers, well-known and well- loved actor/show host John O�Hurley (Seinfeld, Dancing with the Stars) shares lessons learned from his life with canine companions, including: Every 15 Minutes Is a New Day; Never Miss a Nap; When One Person Stops Petting You, Move On; A Cold Can of Meat Is Still a Feast; and You�re Only as Big as You Think You Are, to name a few. �Dogs, after all, have pure hearts, trusting natures, a zest for living, noble characters, and an ability to take things in stride,� writes O�Hurley in the book�s introduction. �They can be counted on, and are pleasant companions. They know what�s important, always. How many humans do you know about which you could say the same?� At once poignantly moving and laugh-out-loud funny, It�s Okay to Miss the Bed on the First Jump is a book for the dog lover on everyone�s holiday shopping list. To ask other readers questions about It's Okay to Miss the Bed on the First Jump, please sign up. Nice little gems of wisdom and life lessons from dogs and Mr. Peterman! Who knew? I laughed, I cried, it became a part of me! Seriously. I love dogs but this book was nothing to bark about. I picked this up in the used book section when I had some time to kill. Pretty much the definition of beach reading. A breezy read, short chapters, fairly light stuff. Some good insights but little that will bowl one over. Big fans of the author will get some neat biographical insights and dog lovers will appreciate some of his pets' antics. I am so delighted to read this book. It was a book borrowed from a friend. And trust me I am totally bowled over with this gem of a novel from John. Its so simple to read through like a breeze. Yet so much to learn from every bit. I must say, read this one and take down your own little notes for self help. A friend sent me this little book. It's a book of essays about whY the author has learned from his dogs. I enjoyed it. It was well written & very funny in parts. I enjoyed this book. It was a quick read but gave O'Hurley's spin on having had dogs all his life and the lessons they've taught him. It was lighthearted but insightful. Achievement is one of the most important elements of the human experience. Along with acts of love and compassion, it is one of the fundamentals that give our lives meaning. A life devoid of achievement is a life wasted. It is as simple and brutal as that. What is fascinating about dogs is they innately seem to get this. Dogs focus on what they want and go for it. Self-assessment and goal-definition are often the biggest logjams to the flow of achievement. Many of us are unhappy in our present s Achievement is one of the most important elements of the human experience. Along with acts of love and compassion, it is one of the fundamentals that give our lives meaning. A life devoid of achievement is a life wasted. It is as simple and brutal as that. What is fascinating about dogs is they innately seem to get this. Dogs focus on what they want and go for it. Self-assessment and goal-definition are often the biggest logjams to the flow of achievement. Many of us are unhappy in our present state and are not fully aware of it. We mask our disenchantment with drugs, alcohol, or other destructive behavior so we are physically and mentally unable to be accountable for it. Sometimes we intentionally become victims of our circumstances in life in an unconscioius effort to avoid taking responsibility for a positive self-appraisal. They are always grateful as if it were the first time. My dogs have taught me to appreciate more fully and assume much less. Appreciation, for me, is an act of humility, a way to acknowledge what we cannot or did not do for ourselves. It sets a balance between being individual acts of self-fulfillment and being simple creatures of need. For dogs, every fifteen minutes is a brand-new day. Dogs don’t have expectations beyond their immediate needs. They’re not obsessed with their potential. They’re not crippled by regret. Dogs live totally in the present moment. In many ways, it’s a good deal healthier. Dogs seem to confront naturally, humans confront conditionally. Dogs confrontations are physical; rarely are adult confrontations anything but verbal. (he hasn’t watched any of Springer has he) Most of our lashing is done with our tongues, not our fists. We define ourselves not only by what we say yes to, but by the courage to say no. We often agree with the status quo rather than expend the energy it takes to evoke change. Yet, confrontation is a healthy and necessary part of sharing space on this planet. Sometimes we have to take a stand at the fence (like the dog) and imagine the giant within us. All dogs stretch. Dogs understand their bodies because they are, by nature, physical creatures. They condition their bodies because they need them. Human beings do not. By forty, only one in ten adults can touch their toes. It is no longer important how I run, but that I run, and enjoy the view. They ask so little in return for what they give, yet they give so much, and they give in silence. I went into this thinking that I would read funny and charming tales about the author's dogs. Instead, I feel this is one of those book deals only offered to a famous person: an opportunity for him to write about his life and loosely tie his experiences into a topic the public actually wants to read about. While the premise sounds like it will be about dogs, the actual meat of the book skews much more towards the author's quasi-achievements in his youth and the lessons he learned...which he then kind of sort of mushed together with common dog characteristics. These are not the hilarious retellings of antics a dog such as Marley would get into. Instead, one of his lessons is literally "I learned to not be ashamed to take naps because dogs take naps and they don't apologize for it." You know what else dogs don't apologize for? Licking themselves and eating rabbit poop. Being a dog owner (or do they own me?) and dog lover, I was drawn to this book. That said, I was hesitant to read another book predicated on dogs and what they teach us, particularly when I learned that one of the author's dogs is fifteen years old, because it always seems that a dog dies before the last page and I'm completely depressed and teary-eyed throughout the reading. Happily, this book was a welcome change from that scenario! Both of the author's current dogs made it through the entire Being a dog owner (or do they own me?) and dog lover, I was drawn to this book. That said, I was hesitant to read another book predicated on dogs and what they teach us, particularly when I learned that one of the author's dogs is fifteen years old, because it always seems that a dog dies before the last page and I'm completely depressed and teary-eyed throughout the reading. Happily, this book was a welcome change from that scenario! Both of the author's current dogs made it through the entire book, and the book as a whole was very upbeat. The lessons John O'Hurley learned from the dogs in his life, particularly his present pups Betty and Scoshi, were lessons we all have learned - or should. John O'Hurley is an actor and comedian, and his comedic roots come through in the prose of the novel. Instead of crying my way through another book about dogs and why we love them, I was laughing and nodding my head in agreement. A great book in which O'Hurley reminisces about the dogs in his life and the lessons they've taught him, simply by being dogs. The main themes in the book are that we as humans tend to take ourselves too seriously and stress out over insignificant things in life. Dogs live in the present and don't act as if what happened in the past matters, and other than short term goals that are more a part of routine than 'plans', dogs don't live in the future either. Dogs also don't spend too much time dwel A great book in which O'Hurley reminisces about the dogs in his life and the lessons they've taught him, simply by being dogs. The main themes in the book are that we as humans tend to take ourselves too seriously and stress out over insignificant things in life. Dogs live in the present and don't act as if what happened in the past matters, and other than short term goals that are more a part of routine than 'plans', dogs don't live in the future either. Dogs also don't spend too much time dwelling on failures, as the title suggests, they simply gather themselves up and try again as if nothing ever happend. These are just some of the examples, but the others are just as good. But reading this book makes me respect dogs more. And adore John O'Hurley even more, if such a thing is possible. He writes with incredible wisdom interspersed with his inimitable humor. Michael and I went to a presentation John O'Hurley did on this book last year and it was great! He was so entertaining and it was awesome to be able to ask him all sorts of questions and hear his answers. It was really awesome and this book is fun. I think it would be even better to the book on cd as he's the narrator and the way he speaks is what really makes his humor so fun. So, if you just have the book you'll just have to imagine him talking as you read -- still pretty good! Divided into chapters about various lessons we can learn from our dogs, this is quick and uplifting read. The author and actor has learned lessons on napping, relaxing, confidence, living in the moment, and other insights that he has learned. Included at the beginning of each chapter is a cute picture of a dog. While not terribly profound, it is worth reading for those who would like something light and for dog-lovers everywhere. I got this book for my boyfriend because i thought he'd appreciate it being the dog lover he is. We read it out loud tonight before bed and I couldn't go to sleep till I shared what a book this is. It's such an awesome perspective and just the right amount of quirky and innocent that jumps right to the soul of an actual puppy. Must read for dog lovers!!! I recently read another dog book, but did not enjoyed it because the author was way too endulging...but this author did not self endulge, but was able to talk about dogs and life lessons in a way that does not protray him as a "preacher", in other words, he did not come through as a know-it-all. Cute, uplifting read about life through the eyes of a dog...told by a man. Well written, and from my view very true. Dogs are amazing animals full of unconditional love, happiness, and life, and they are not full of the stresses and drama that we have to deal with everyday. And we should all try to see the world through the eyes of a dog, at least once in a while. Dogs not only bring us unconditional love, but they also teach us some life lessons if you let them. 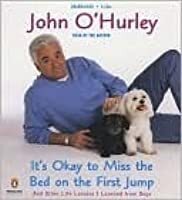 And thus the premise of John O'Hurley's book It's Okay to Miss the Bed on the First Jump. If only humans could be as surrendering and nonjudgmental as dogs, we'd be a happier, more accepting species. 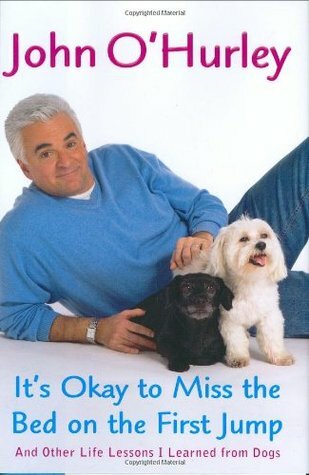 The book was slightly more interesting because I have seen the author on TV, specifically, as J Peterman on Seinfeld, and I sometimes watch the annual dog show that he hosts. I liked that the book was fairly short and had some funny tongue-in-cheek humor about dogs. It was a nice read to pass the time on the airplane. I really enjoyed this book. Hurley is very good at capturing the funny essence of living with a dog. Wish there were more fun books like this that lift the spirit and heart through our wonderful canine companions. I would give it 5 stars if it was a thicker book. I admit I really enjoyed the book. Learned some things about him I didn't know about him before. I like like eat he describes how he loves tomato soup. I'm glad I own this book. Good light reading, and fast. Funny and adds some touching life lessons from John O'Hurley. If you love dogs you will get a kick out of the book. rather endearing. i got my first wake-up kiss this morning. I guess 7:30 is it for me! This is great book!! I enjoyed every page, the stories made me smile and even laugh out loud. Every dog lover should take the time to read this. I now get why I love my dog so much and the fact that I'm not the only one! Any "honest-to-goodness" dog lover can easily relate to any of the stories shared by John O'Hurley. Funny and witty... love the book! The author's perspective on the life lessons from his dogs are really worth pondering on.